The Oklahoma League of Legends community has seen its fair share of growth and decline, starting from humble beginnings to boasting an almost 2,000 current member population. But something new has made its way on to the OKLoL scene, breathing new life in to the stagnant group and leading to a jump in activity: The Oklahoma League Championship Series. 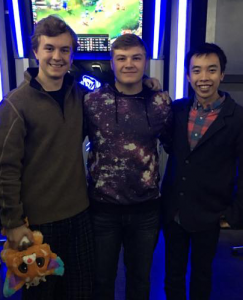 The OKLCS, an online League of Legends tournament scene, started with two college freshman, Jack Counts and Alex Tu, attending various League tournaments across the state. They lurked on the OKLoL Facebook page, posting here and there and gradually became more involved as time went on. After attending multiple tournaments and gaining experience within the tournament scene, the pair knew something was missing. Nathanial “scrambles19” Wawrzynaik, Mid lane substitute for the gold-capped team Freelance Five, takes a snapshot of his team at the OKLCS season two finals. After receiving an outpour of support from the community, Alex and Jack got to work on the details. They worked out every detail, from the website to advertising to the ruling structure. After meeting with team captains, they came up with a model ready for a test run. Season one ended with eight teams divided into a two-division setup, gold-capped and diamond-capped, with four teams in each division competing in a double round-robin style bracket, played completely online. 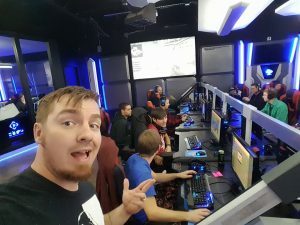 With the experience under their belt, they looked to expand the league and have more of an actual season with teams playing each other weekly and games streamed on Twitch.tv. Entry fee into the season cost $25 a player, which went into a prize pool for the finals. Jack competed on a diamond-capped team and Alex took on the role as main shoutcaster. The finals for season two were played LAN style at the RTZ eSports arena in Oklahoma City. The OKLCS will continue in February with its third season, and Jack and Alex plan to continue leading the charge.